The UAS AOC is a NASA Centennial Challenge that fosters the advancement of unmanned air systems technology which is critical to their safe use in United States airspace. The competition will be completed in two phases. Rules for the competition are available here. Phase 1 of the Challenge is scheduled to be held April 28 – May 7, 2014 and Phase 2 of the Challenge will follow approximately one year after a team has successfully met the requirements of the Phase 1 event. Phase 1 of the Challenge focuses on important aspects of safe ground and airspace operations, robustness to system failures, and seeks to encourage competitors to get an early start on developing some of the skills critical to Phase 2. 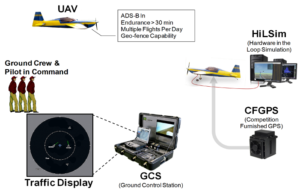 Competing aircraft must be able to demonstrate safe operations in a complex air traffic environment within a confined (geo-fenced) region of the test airspace in the presence of both cooperative and uncooperative unmanned aircraft. 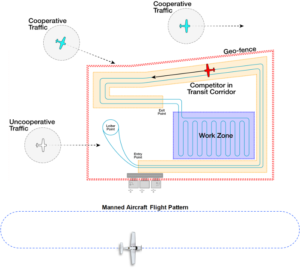 Cooperative aircraft will transmit ADS-B signals. The competition vehicle must be able to detect and avoid cooperative aircraft by interpreting ADS-B transmissions and must maintain proper separation from cooperative aircraft at all times. 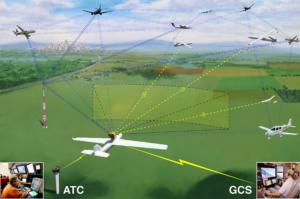 Competing aircraft should also be able to detect uncooperative aircraft that may not be transmitting ADS-B but will not be required to maintain separation in the Phase 1 competition. Figure 1 illustrates the air traffic environment. In order to participate in the competitions teams that include a pilot in command and ground crew must be able to operate the test aircraft using a ground control station located at the test site according to competition rules described below. Prior to competing, teams will be required to operate the test aircraft in a hardware-in-the-loop simulation environment on the ground. All aircraft will be equipped with competition furnished GPS (CFGPS) units that must be integrated into the aircraft control systems. Detailed specifications of the CFGPS units will be published according to the schedule published in the competition rules so that teams can replicate CFGPS for use in their own testing prior to the competition. These concepts are shown in Figure 2.